The demonstrations dubbed 'March to the Polls' are follow-ups to the Women's March movement following President Trump's election victory. CHICAGO — Balloons depicting President Donald Trump as a baby hovered over thousands of sign-holding activists in downtown Chicago Saturday who hoped to send a defiant message to Republicans ahead of next month's midterm elections. 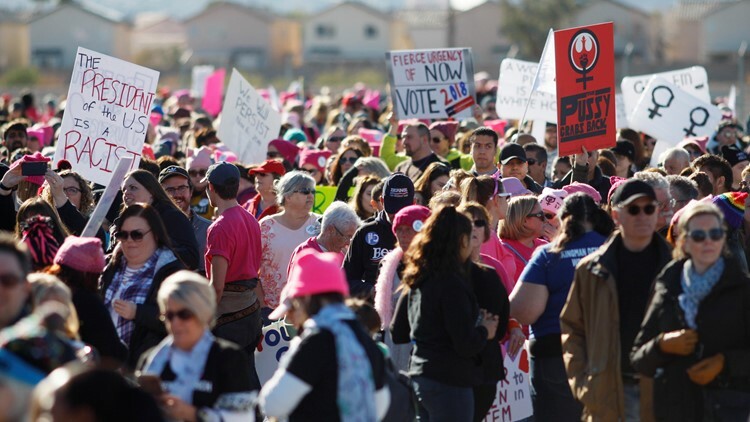 The several thousand who rallied Saturday didn't meet the 350,000 originally projected by organizers. Protesters brought along signs and chanted "dump Trump" in the heart of the city as several candidates, who set up booths at the event, pitched their platforms and recruited volunteers. "In a society that tries so, so hard to suppress our voices, the act of simply going out and voting is an act of resilience and resistance," Lauren Hogg, a survivor of February’s mass shooting at Marjory Stoneman Douglas High School in Parkland, Florida told the crowd. 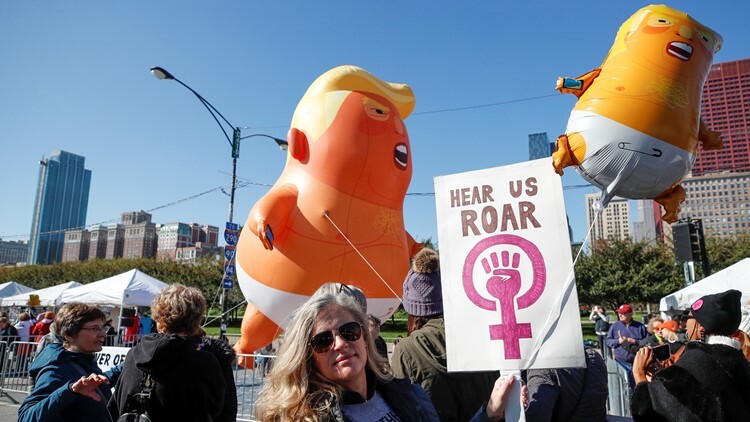 Women gather for a rally and march at Grant Park on October 13, 2018 in Chicago, Illinois to inspire voter turnout ahead of midterm polls in the United States. Some at the march said they feel desperate to see Democrats win in November and become a more meaningful check on Trump. But they acknowledged that polls that show Republicans gaining ground in Senate battles following the Kavanaugh confirmation have left them frustrated. Organizers put a special emphasis on turning out the youth vote. Historically, participation among young voters is weak in midterm elections. In 2014 elections, about 19.9 percent of 18-to-29-year-olds cast a ballot, marking the lowest youth voter participation in 40 years. Jane Christie, 63, made the 90-mile drive from nearby Iroqouis County, Illinois to be part of the march. Sen. Heidi Heitkamp, D-North Dakota, who opposed Kavanaugh’s nomination is trailing her Republican challenger, Rep. Kevin Cramer, 53 percent to 41 percent, according to a recent Fox News poll. Thirty-four percent of likely North Dakota voters surveyed before the Senate voted to confirm Kavanaugh said they were less likely to vote for Heitkamp if she cast a ballot against him, while 17 percent said they were more likely to vote for the Democratic senator if she voted against his confirmation. But one poll published earlier this week that showed Heller with a 46 percent to 44 percent lead also indicated Nevada voters were divided on Kavanaugh. The NBC/Marist poll found that 38 percent of likely voters saying they’re more likely to vote for a candidate who supported Kavanaugh, while 41 percent said they were more likely to vote for a candidate who opposed Kavanaugh.